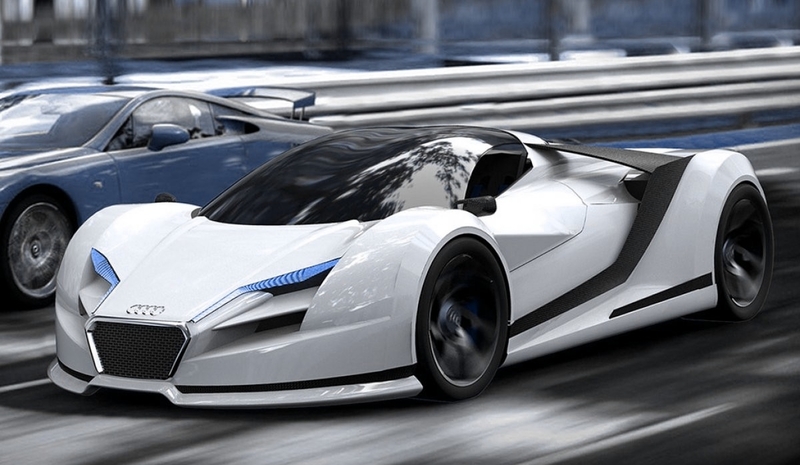 This is the Audi R10, another hypercar idea for Audi which goes a stage over the R8. Motivated by LMP autos, old F1 autos and plane contenders, with the extremely propelled position of the cockpit and its trademark bolt molded body. In the front, this new R10 highlights a littler and crisper advanced Audi grille, grasped by sharp-edged LED headlights, while the back has a slick and clean tail segment. Taking after the Audi's theory "vorsprung durch technik," this two-seater hypercar, back mid-motor design, is a flawless games machine, proficient to hold a TFSI twin-turbo V8 motor consolidated with an electrical motor, giving a joined force of more than 900 hp, all wheel drive and propelled streamlined features, with the front wings coordinated in the radiator channels and the back wings in the extended and stretched sideblades, which are shaped from uncovered carbon fiber which give a differentiation against the splendid white paintwork.